Sandwiches are a classic road food for good reason. 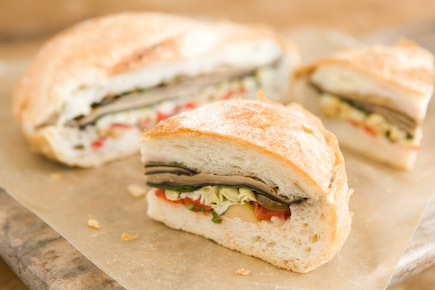 Perfectly portable, summer is a great time to work on your sandwichology. And to make everybody happy, consider letting your backseat drivers create their own sandwich masterpieces the day before the big trip. Just wrap them well and store with cold packs until everyone’s ready to dig in. Or store the ingredients in separate containers and build at mealtime, to avoid soggy bread. Use alternative seed or nut spreads like tahini or cashew butter with an unexpected fruit spread like boysenberry jam or quince jelly. Grill veggies or tofu ahead of time for a roasted sammie. We’ve got the perfect trio: roasted yellow peppers, ripe tomatoes and a spread of cream cheese on a French baguette. Herbed goat cheese and red onions are divine when paired with sliced turkey or roast beef. Go gluten-free by wrapping sandwiches in large lettuce leaves or rice paper wrappers.